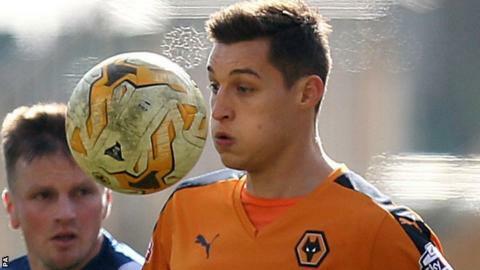 Injury-hit Wolves have suffered a new blow with the loss of Michal Zyro for potentially more than a year with multiple knee ligament damage. The Poland international was injured following a late challenge on his left knee by defender Antony Kay in Tuesday's 2-1 away win at MK Dons. Following an initial scan, the 23-year-old forward is now facing surgery. "If he gets back in under a year, he'll have done well," Wolves head of medical Phil Hayward told BBC WM. "He's really looking at a full year and maybe more than that. "He has suffered damage to both the cruciate and lateral knee ligaments, as well as other structural damage. There is a small fracture on the inside of the knee, indicative of the amount of force involved in the challenge. "He will see a consultant this week and undergo surgery once the swelling has subsided at some point in the next two weeks. The timeframe will become more apparent following surgery. But he is expected to be out for a considerable time." MK Dons defender Kay was yellow carded for the challenge by match referee Mark Heywood. Zyro is the third Wolves player to suffer a serious knee injury this season. Striker Nouha Dicko has been sidelined since August, while winger Jordan Graham was then himself ruled out for up to nine months in January. Wolves have also lost winger Razak Boukari and defender Ethan Ebanks-Landell for the season, while centre-half Mike Williamson (thigh injury) has not figured since returning to the club from Newcastle United in January. Since Christmas, they have also spent long spells without Zyro, who missed two months with a calf injury, James Henry, Dave Edwards and Jed Wallace. Henry made his first start since February in midweek, while Wales international Edwards made a late appearance from the bench. Wolves head coach Kenny Jackett has cleared up confusion over midfielder Kevin McDonald's whereabouts. It was reported that the 27-year-old Scot had been told to "train with the kids" after being left out of Jackett's matchday squad of 18 at MK Dons. But McDonald actually voluntarily chose to keep fit with Wolves' Under-18 side. They were the only ones in training, because the Under-21 team also had a game on Tuesday. McDonald, Wolves' player of the year in 2013-14 when they won the League One title, has not made the starting line-up since 8 March and has been linked with an end-of-season move to Scottish Championship winners Rangers. Wolves boss Kenny Jackett and head of medical Phil Hayward were speaking to BBC WM's Rob Gurney.